The Seaga HY900 Healthy Combo Vending Machine contains the Healthy You graphics on it but no franchise agreement is required since you will be purchasing this from The Discount Vending Store. This machine is packed with cool features. 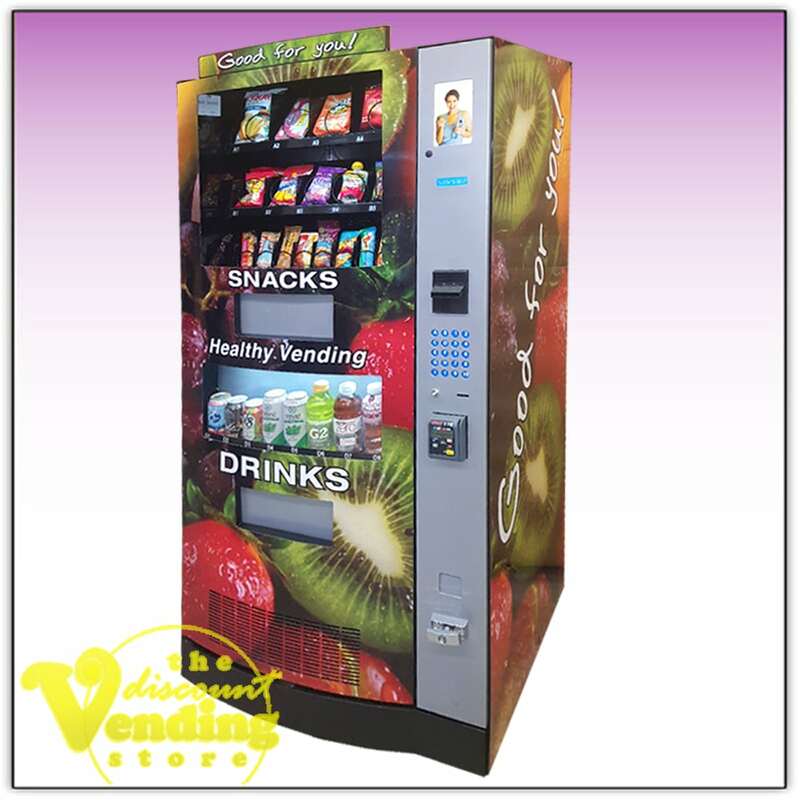 It comes with the healthy vending machine wrap on the front and one of the sides of the machine which makes the machine stand out. There is an optional USA Technologies credit card reader which can be added to the machine. Best of all, this combo machine accommodates a huge selection of drinks. You can vend 8 different cans or bottles of various sizes in the refrigerated portion of the machine. In addition, the machine provides 21 different snack and 16 different entrée columns in the non-refrigerated portion of the vending machine. The combo machine contains a Dollar Bill Validator which accepts $1 & $5 bills. The coin changer will accept nickels, dimes, quarters and returns change in coins. The optional credit card reader is made by USA Technologies and will accept all major credit and debit cards. 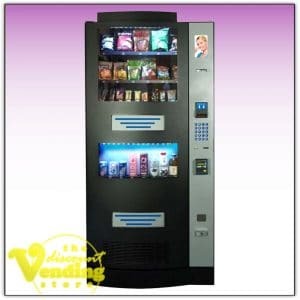 The HY900 Healthy Vending Machines are manufactured by Seaga Manufacturing. Parts for this machine are readily available from the manufacturer and we also carry many of the parts which we can sell to you if needed. Included with the purchase is the owner's manual, and two sets of keys. 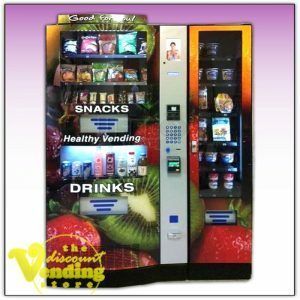 The Seaga HY900 Healthy Combo Vending Machine is manufactured by Seaga Manufacturing and it is the actual machine which has been distributed from Healthy You. 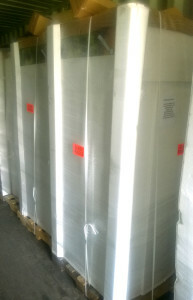 This machine is Brand New in the original packaging, but has been stored in a warehouse before it shipped to you. Since Seaga modifies the design of their machines from time to time, the parts and firmware may differ slightly from other HY machines. The machine includes a full one year warranty on all the parts provided by us at The Discount Vending Store. We also provide a lifetime of technical support and assistance to you as long as you own the machine. 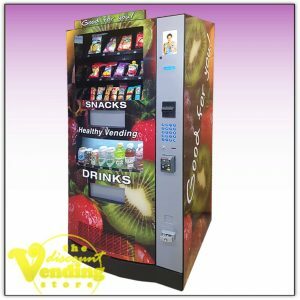 The Discount Vending Store is not affiliated with Healthy You and the purchase of this machine from The Discount Vending Store does not entitle you to programs or features offered by Healthy You. 1. The optional credit card reader is made by USA Tech and can be activated by calling USA Tech. It can double your sales without doing any extra work. No wires are needed as it's totally wireless. It provides a sales log which can be accessed remotely to see your daily, weekly or monthly reports. This makes tracking product sales very simple and reliable. For more info on the credit card readers, please visit our blog. 3. There is an optional media link digital picture screen which is a small 7" screen at the top right corner of the machine. This allows you to upload photos or messages which will fade in and out which advertises products or displaying messages to your customers. 4. If you would prefer the machine without the healthy vending wrap, we can remove the wrap and it will be a black machine. One year warranty on all our new machines!